I hate wrapping presents. I hate wasting the paper that will be torn away and discarded. I can never get the corners write. It’s a waste of my time and a waste of resources. Paper gift bags have made gift wrapping easier, and we do reuse the ones that are given to us, but there is another solution. My stepmother used to wrap a few gifts in fabric. I have tried this method, but the scotch tape really doesn’t stick, plus the scraps of fabric I guiltily keep thinking some day they will become part of a project, but they usually don’t. VZ Wraps are different. Made from organic cotton with many cute designs, these reusable clot gift bags are sure to be kept and continue beyond one gifting. The bags are made in the U.S.A. from organic and traditional cotton with attached ribbons made from recycled materials. The eco-grosgrain ribbon is made from 100% recycled plastic bottles, and the eco-satin is made from 100% post-consumer recycled polyester. Drop your gift in, tie the bag closed, and your wrapping is done! Reuse the bags for years — the attached ribbons won’t get lost. Why use a fabric gift bag? · According to the Clean Air Council, an additional 5 million tons of waste is generated in the U.S. during the holiday season and a substantial portion of that is wrapping paper and shopping bags. Wrapping paper generally can’t be recycled because it is dyed or laminated, contains non-paper additives, or is too thin to have good-quality fibers. · Wrapping gifts the traditional way is time consuming and often difficult for odd-shaped packages. Did you ever try to wrap a stuffed animal, a tennis racket, or a toy piano? Plus all those toys in clamshell packaging are just asking for a wrapping paper disaster. · Reusable paper gift bags have been a common trend in recent years for simple gift-wrapping, but they are flimsy and prone to falling apart after one or two uses. Plus they are generally made with non-sustainable and non-recyclable materials. 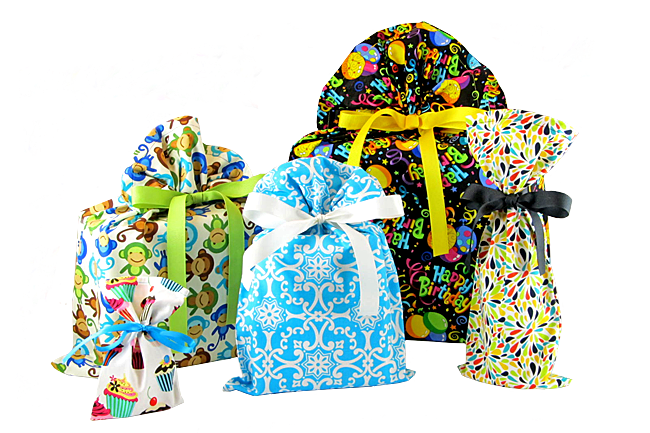 A VZWraps fabric gift bag is a sustainable choice that will last forever. Eliminating the trash bag full of wrapping paper that often cannot be recycled, making gift wrapping easier, and organic cotton material…I like VZ Wraps. « 7 Natural Weight Loss Supplements: Do they work?